Recover deleted, lost and damaged files quickly and easily! Get a free file report! Now includes Photo SmartScan for enhanced photo recovery. Lost a photo? Photo SmartScan will find it! Quick and easy recovery of deleted files. Great tech support- our staff is always there to help. Advanced technology ensures the best possible file recovery. Fast scan engine allows to scan a hard drive within minutes. Supports FAT16, FAT32 and NTFS file systems. Supports all modern types of hard drives. A quick, easy and effective way to recover deleted files and photos. 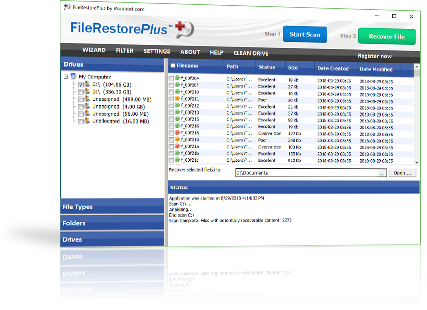 FileRestorePlus™ can recover files even after you empty the Recycle Bin, Shift-deleted files and files deleted using the Command Prompt. Download Now! Get a free file report!